Covers 15 board feet (which is 15 square feet at 1 inch thick). For larger areas consider, 200 board foot kit or 600 board foot kit. 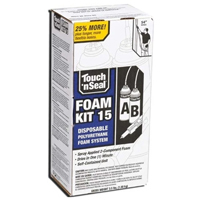 This polyurethane insulation foam kit is part of the Touch 'N Seal family of sealing and insulating products. It is convenient in that the foam tanks are both portable and disposable. Set up is made simple with the upside down dispensing hoses, which are pre-connected, and anti-crossover P2 applicator gun. With this tool, the foam is dispensed easily, quickly, and consistently. The Touch 'N Seal 200 Foam Kit is high expansion, expanding 30 times and drying in under 1 minute. The foam contains no urea formaldehyde or CFC's. It is a closed cell foam. When the foam is applied to ceilings, walls, and floors, it essentially protects against unwanted air exchanges during extreme weather months. By doing so, heat loss is prevented in winter, and cool air is prevented from leaving the home in summer. In addition, the polyurethane foam blocks insects and other critters from having easy access into the home or building where applied. Properly installed, the foam increases the overall comfort levels in a home or building and lowers energy consumption, thus reducing the cost of energy. By sealing air leaks with caulk prior to applying foam, savings of up to 20% on heating and cooling are possible. Touch 'N Seal Foam Kits (200 and 600) also come in a fire retardant (FR) formula for added safety. Material Safety Data Sheet: Component "A" and Component "B"